This work examines the development of a "dissenting" perspective on the emerging doctrine of the Holy Spirit in Post-Reformation Protestant thought. 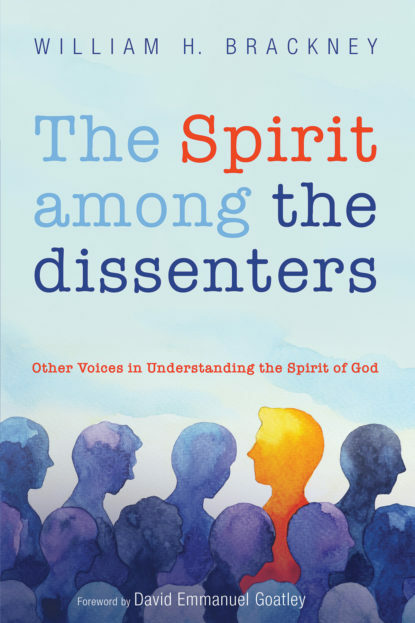 By "dissenting," the author means "beyond the mainstream of thought, sometimes affirming but expanding orthodox positions, but at other times pursuing new directions and images of the Spirit." A new look is offered at the Puritan-Separatist era in English dissenting traditions, as well as organized dissenters in the seventeenth and eighteenth centuries. Of particular interest are the applications of current philosophic and scientific writers. There are sections on major German thinkers of the nineteenth century and major influential theologians of the last century who laid new foundations in the doctrine of the Holy Spirit. Readers will be interested in the inclusion of new religious movements in two eras, and creative contemporary ideas of the Spirit. How an ongoing "dissenting" perspective contrasts with mainstream thinking is woven through four centuries of literature on the Spirit. The author contends that we have learned much from the "dissenting" perspective, and he offers seven constructive affirmations of the Spirit of God drawn from his survey and analyses of the previous four centuries. The bibliography is comprehensive of major works on the doctrine of the Holy Spirit, plus unusual sources of dissenting thought.